What are you going to do on Valentine's Day? Dinner for two? Give a dozen roses to your sweetheart? Give a gift and a Valentine card? We take Valentine's Day for granted, those of us who give this day it's special meaning. In other places of the the world celebrating Valentine' s Day is imitating western culture, which is bad. Young people are discouraged from celebrating it. In India celebrating Valentine's Day is getting popular with the young people. But it is not without it's controversy. Hindu hard liners have threatened to beat up young people who exchanged cards or gifts. Can you imagine getting this kind of response from people who don't want you to celebrate Valentine's Day? "We earnestly request young lovers not to exchange flowers and cards on Valentine's Day," said Harish Dubey of the Hindu Awakening Forum said in Lucknow, capital of Uttar Pradesh, India's most populous state. "Those who do not listen to us will face our volunteers' wrath. Their faces will be blackened and they will be beaten up," he said. Would you dare to ignore such a threat? Would you dare to face the wrath of such radicals, for the sake of exchanging a gift or card? Muslim groups are also not happy with their youth celebrating Valentine's Day. 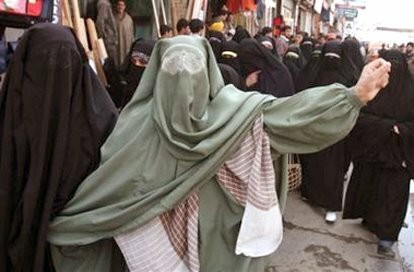 Last week in Kashmir, two dozen veiled muslim women (see pic below) stormed gift and stationery shops and began burning Valentine Day cards and posters! Talk about over-reacting! In Uzbekistan, the "government has passed a resolution stating that celebration of St. Valentine’s day was unacceptable in Muslim countries". In Malaysia Valentine's Day is becoming more and more acceptable. Sure, you do hear complaints and rumbles among the more conservative muslims. But if you are muslim, don't go dating in the parks on Valentine's Day! As in past years, this is when the religious police will go out in full force and nab courting couples in public parks! And don't forget hotel rooms .. some people might come knocking at the door and interupt your romantic evening! Heheh. Happy valentine's day puteri. Love has no reason. Ba kami ditu puteri, student M****u ka bejual ka bungai ros. Sida mega ka meli & beri ngagai pangan sida. Dating & celebrate! Nadai orang nganu...hehe. Happy Valentine's day ngai nuan. Hi Puteri, I noticed that you have removed one of the comments. Was it from some muslim fanatic? Happy Valentine's day to you too. I don't really celebrate the day, because over here it's getting a little too cheesy, with girls walking around with their beaus and flowers in their hands. Malu lah.. childish should I say. As for religious officials .. they are nothing mor than peeping toms.. after they have done watching, it's time to nab the very persons that give them sinfully good sight...shame on them.. shame on them for attacking our private lives in the name of religion..
By the way.. ahere have you been? Do drop me a line, will you?